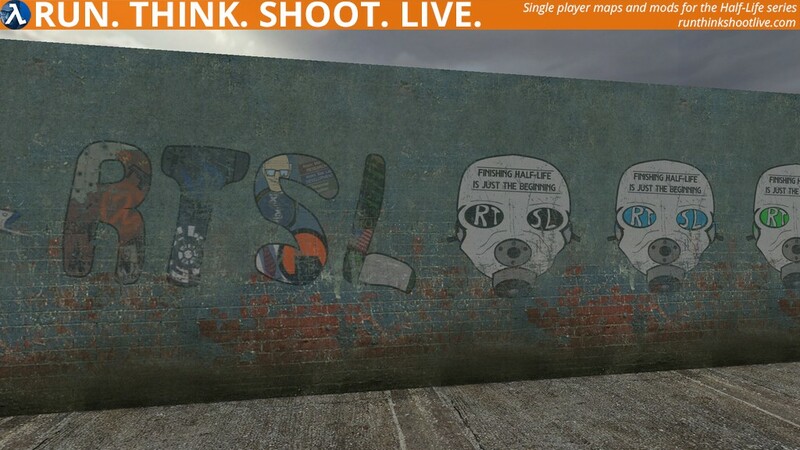 I am very pleased to announce that some exclusive RTSL graffiti has been created by Monkeymo and I would like to thank him for all his hard work. We worked together to get exactly what I was looking for but he did all the work. After some feedback from the modders over on the official The Hammer Cup 2017 SMC Discord channel a grunge/grimmy feel was settled on. 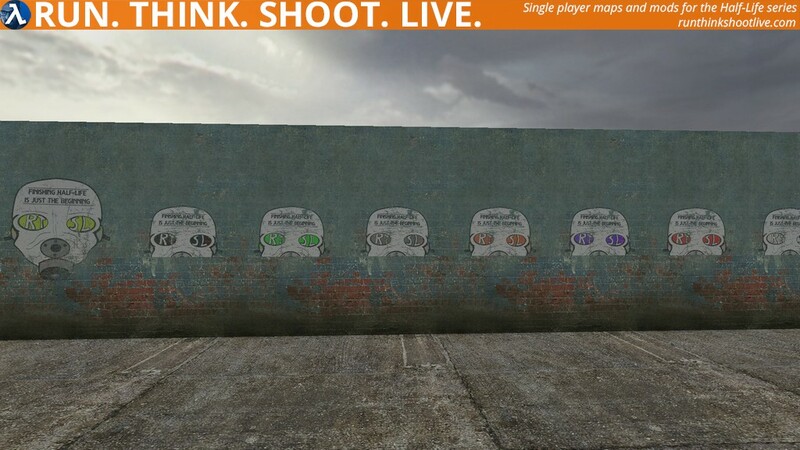 Crowbar converted the images into VTF (files that can be used by modders) and made the demonstration map, from which the image below have been taken and I would like to thank him too. 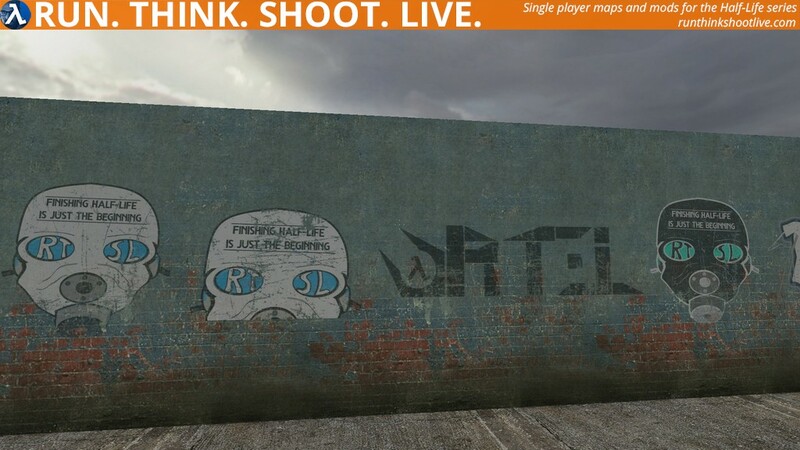 The graffiti is available for use by any mapper and no entry to any mapping challenge is obligated to use them. They can be used in any non-commercial Source release but a credit to Monkeymo and RTSL MUST be included. In future, I may offer a small prize (or even extra points if the judges agree) for clever use or placement of the graffiti in maps entered into mapping challenges. To use them, just place them in the materials folder. Please remember, that these are for use by mappers. Hello everyone! I’m the creator of these graffiti design. It was a lot of fun to make and I hope mappers like using these, too. Also, thanks to Crowbar for converting to .vtf. For the rest of this, I’m going to give some developer commentary on the designs. 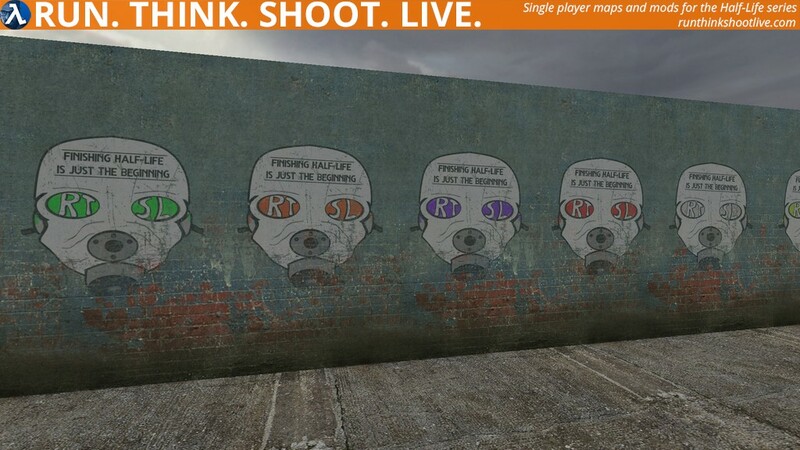 I have had some experience doing graffiti stuff, and I wanted to see if I could fulfill Phillip’s request. The first part was making some paper and pencil sketches, creating concepts for the final design. I emailed Phillip the scanned sketches and he gave feedback on which ones he liked. Once they were narrowed down, I performed the process of tracing over them in Photoshop and sent him those. They were previewed on the THC Discord server and I went there to gather feedback from the users of the site. It was agreed upon that the designs looked too clean and pristine. Scratches were applied to make it look worn and fit in with the rest of the decals. This design is based directly off of the ‘CMB’ logo used by the Combine. I really like the aesthetics of the Combine and wanted to try my hand at imitating their font style. The original concept for this was just the half face. Phillip said he wanted the full face, so I obliged him. While experimenting, I inverted the image and I like the way it looked, so I included it with the final designs. Phillip also asked for colour options for this and the rest of the designs. Not much to say here. 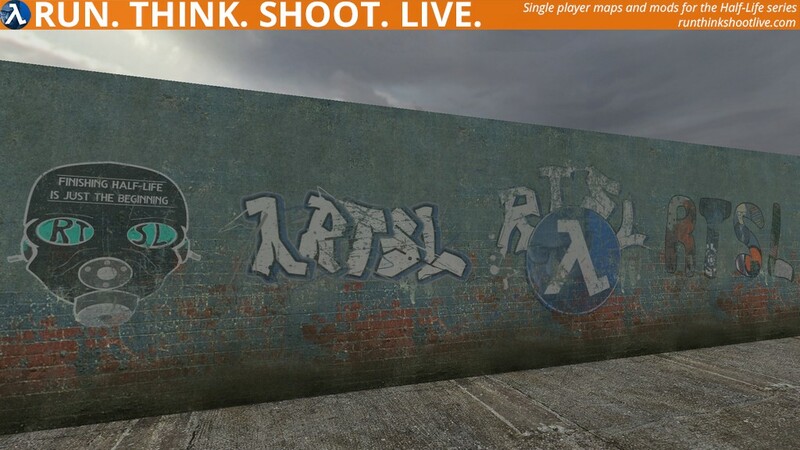 This is just RTSL written in a graffiti style. Again, alternate colours were provided by request of Phillip. I wanted to use the logo in a graffiti tag, this is the final result. One problem I ran into was that I only had a 128×128 resolution version of the logo, so I had to either make everything low res or have the logo become blurry. I went with lower res, but you can’t really tell in the end. This took a long time to make. I wanted to have a font with pictures within, hence the name. 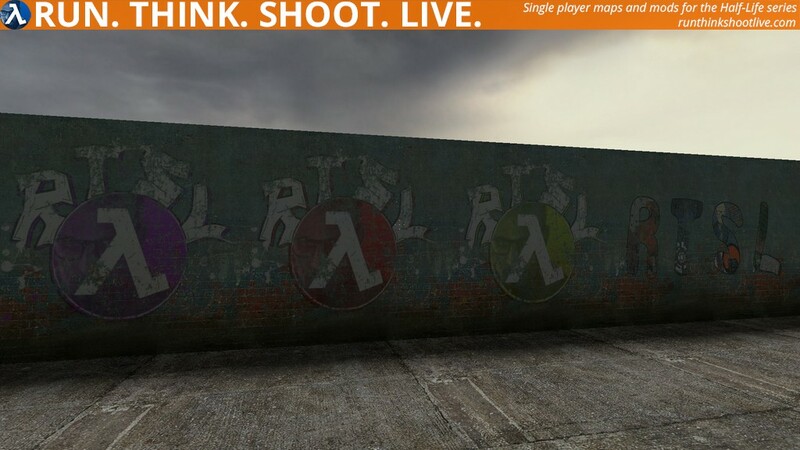 Each letter references a faction within the Half-Life universe: Rebels, Combine, Black Mesa, and HECU. 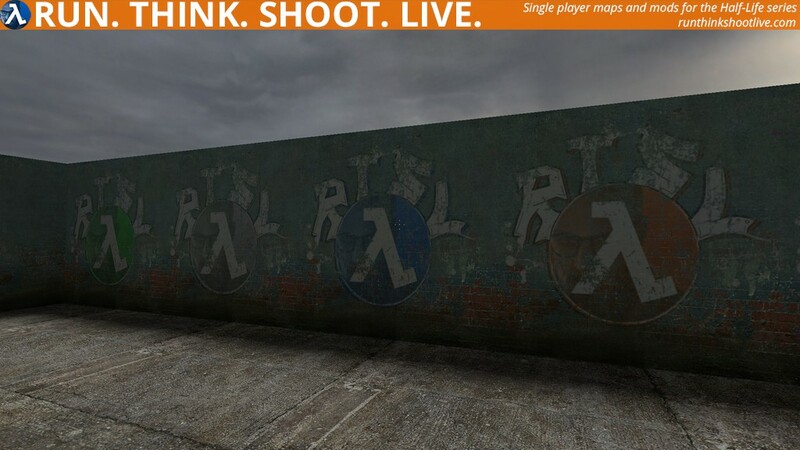 The first version had a references to each Half-Life game, but that was too limiting. And that’s all I got, hope to see these in maps soon! Fantastic job, can’t wait to see these in future competitions! Thank you for your hard work! I have a wild idea: what if use of the graffiti were compulsory for challenges? I was thinking about the Tropfest short film festival (tropfest.org.au) that requires a “signature item” in each film to prove it was made for the competition. Part of the fun is watching or re-watching the entries to find it. Of course, not all environments would be suitable (such as combine architecture) but that could be overcome by adding secret areas/easter eggs. Anyway, like I said – a wild idea.